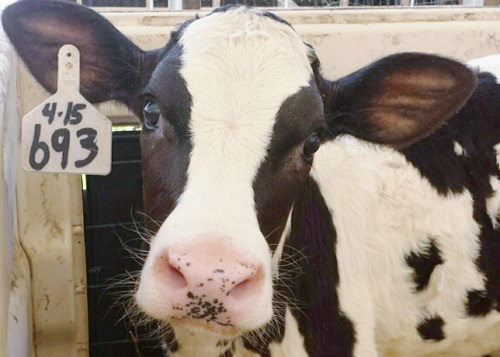 ​Ms Anderson's Adopted CalfSunshine is 2 Months Old!At two months old, Sunshine doesn't need a bottle anymore. Not only can she drink from a bucket, she is also learning to eat some of the foods that the adult cows eat, like hay and silage. When she's grown up, she'll drink a bathtub full of water every day. October is Farm to School Month, which means we have a lot of great activities to share to help you learn more about how dairy gets from our farm to stores and schools like yours. What else would you like to know about dairy cows and dairy farming? Fill out your questions on the activity sheet download below and have your teacher send them my way. Next month, I'll write your class back with answers to some of your questions! 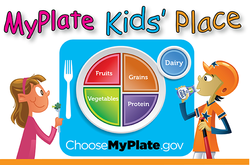 The doors to MyPlate Kids' Place are open! Kids will find games, videos, songs, activity sheets, recipes, and tips to help them eat healthier and move more. Parents and teachers will find new ways to help kids make healthier food and physical activity choices. Teachers and professionals can also add the resources to summer camp and back-to-school efforts. 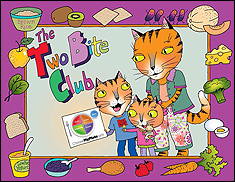 Read about the TWO BITE CLUB!! Join today! for kids, and Tips for Growing Healthy Eaters. about all the components of a well-balanced school lunch. days and keep them healthy – each character comes paired with nutritious eating tips. 1. Fuel up with veggies and zoom to the finish with this cool tracker from Dig In!<http://www.fns.usda.gov/sites/default/files/diginTG_handouts.pdf> (pages 76-77). 2. Roll the dice and learn about the MyPlate vegetable subgroups using Detective Veggie Dice<http://www.fns.usda.gov/sites/default/files/gd_dice_0.pdf> from The Great Garden Detective Adventure (p. 90-91)<http://www.fns.usda.gov/sites/default/files/gd_lesson4_0.pdf>. 3. Dance to The Five Food Groups Song <http://www.fns.usda.gov/multimedia/music/alivewithfive.mp3> from Serving Up MyPlate. 4. Travel to Planet Power by playing the MyPlate Blast Off! game<http://www.fns.usda.gov/tn/blast-game>. 5. Cook up a tasty Fiesta Wrap from the Recipes for Healthy Kids: Cookbook for Homes<http://www.fns.usda.gov/sites/default/files/cookbook-homes.pdf>.